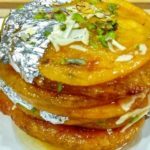 Malpua is a mouthwatering Indian fried pancake recipe for festive occasions. Traditionally made during festivals like Eid, Holi, Diwali and Navratri. Crisp edges and soft center dunked in sugar syrup! Is a traditional Indian sweet from Rajasthan and Orissa very popular thanksgiving recipe of whole north India. So if you’re planning an Indian feast, give this sugar coated fritters a try. Shell the green cardamoms and keep aside. For making sugar syrup add sugar, shelled cardamom, saffron and water in a pan. Switch on heat on medium flame. Cook the sugar syrup till the sugar dissolves, lower the heat and add lemon juice to it (the lemon juice prevents crystallization in sugar syrup). Cook till syrup is of one string consistency. To check whether the syrup has reached 1 string consistency place a drop of syrup between your thumb and index finger and then move the fingers away from each other, you will see a formation of a string. This means the syrup is done. Remove pan from heat and keep it aside. To make the batter for the malpua, add refined flour, milk powder or mava or khoya and desiccated coconut to a large mixing bowl. Crush the aniseed seeds. Add crushed aniseed seeds, sugar, pinch of salt and pinch of baking powder and mix well. Start adding milk, little by little and whisk to form a smooth batter. The batter should have no lumps. It should be a thick batter of pouring consistency. Let the batter rest for 15 minutes. Heat ghee in a shallow pan for frying malpuas on medium heat. When the ghee is hot turn the heat to low flame. Mix the batter again and pour a small scoop full ( approx 2-3 tbsp ) in the hot ghee. The batter will form a round shape on its own, you don't have to shape it. turn the heat to low-medium and fry the malpua, when you are frying one side, splash oil over the other side (which isn't dipped in oil) with a spatula so that it gets little cooked too at the same time until golden, flip the malpua in ghee and fry the malpua on both the sides till golden brown. 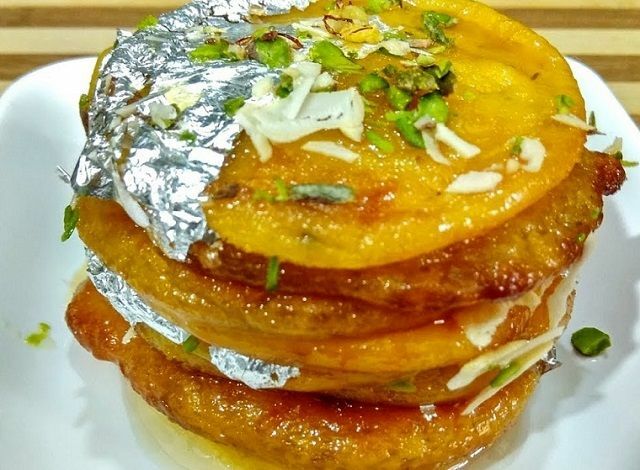 Remove malpua from ghee carefully, draining the oil and dip the malpua directly in prepared sugar syrup (make sure sugar syrup is warm, if its cold just place the sugar syrup pan on low heat to warm it up before soaking the malpua). Soak each side for 1 minute. Remove malpua from the sugar syrup and place on serving plate. Garnish with pistachio, edible silver leaves and serve warm with rabdi.